Reina was the daughter of Leman van Leer and his first wife Froukje Levie. Froukje died on the 22nd of April 1885. Two years later, on the 2nd of July 1887, Leman married his second wife Vrougje Roos. Vrougje was born in 1853 in Staphorst, as daughter of Mozes Roos and Anna Vroom. Vrougje was the sister of Hein Roos who also resided in Meppel. 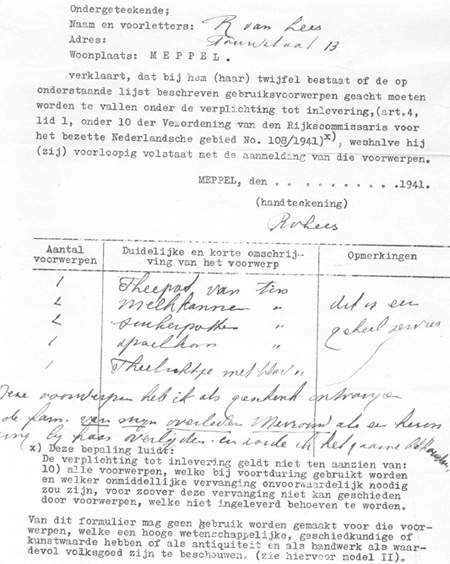 Leman and Vrougje had four children: Rebekka (born1887), Mozes (1889), Rachel (1890) and Jakob (1893). Leman van Leer died on the 30th of January 1921. Vrougje outlived her husband by twenty years. She died in Meppel on the 10th of January 1941. From 1935 she lived with her daughter Rachel, first on Vledderstraat and later on Bankastraat. She was buried in the Israelitische Begraafplaats (Jewish cemetery) in Meppel. She was one of the last Jews to be buried there. With father Jacob I went to Meppel by bicycle. We went to aunt Rachel who lived on Bankastraat. There my grandmother lay in state. Together with my cousins we played hide and seek in the house and also in the room where my grandmother lay; it seemed a nice place to hide. Of course my father did not think that was a good idea. I can still remember the funeral procession leaving the house on Bankastraat. The women were only allowed to go as far as the end of the street, and the men walked all the way to the graveyard on Steenwijkerstraatweg. Reina was born in Drachten on the 7th of December 1880 and worked as a domestic servant. After working in Amsterdam and Den Haag (The Hague) she moved back to Meppel in 1931. At first she lived on Vledderstraat and from 1932 she lived at 13 Touwstraat, opposite the Synagogue. She had a house of her own. On the ground floor the hall, the stairs leading to upstairs, one room, a small kitchen and a cellar. The stairs led to the attic with two bedrooms. Behind the house under a lean-to was a wooden cask toilet. It was all in a bad condition. My aunty Reina was rather religious and the Sabbath rules were strictly respected. In our house we did not, so I did not bear them in mind. Whenever I visited her in Meppel on a Saturday she would ask, ‘Do you want tea?’ When I answered in the affirmative she would say: ‘put the gas on for hot water.’ To put the gas on on the Sabbath was not allowed. That she was religious also appears from the words she wrote during the dark days of the war! ‘I hope that everything will end well and that everyone will keep courage and trust on the Good God. Miracles still happen.’ On the 3rd of October 1942 she was taken out of her house and after staying two weeks in Westerbork she was transported to Auschwitz on the 19th of October and on the 22nd of October she died in the gas chambers. Reina van Leer’s house on the right hand side.